“I’m going to press on your stomach. Let me know if I cause you any discomfort,” Dr. Wilson said. “I have a high threshold for pain, doc, press away,” Unknown said. The doctor pressed, but not hard. More like he loved Unknown and they were courting, laying in the grass falling in love, his hands gently gliding over Unknown’s bloated stomach. “Don’t hurt your hands, doc,” Unknown said. The doctor looked like he was watching water waiting to boil. “I don’t want to hurt you,” he said. Maybe 45 years ago, when he was still in his 70’s. Not now. Perhaps back when leeches were state of the art. “Everything spoils if you leave it out too long,” Unknown said. The doctor ignored him and continued his Ouija Board session, looking with his fingers, like he wanted to find the magic spot. Then when he found it, he’d raise one hand in a claw shape high above and plunge it into Unknown’s stomach, ripping the evil spirit out. Unknown would magically feel better. So simple. But it didn’t happen that way. “Get your clothes on and meet me in my office,” he said, no kiss, no hug, no tug, as he turned and left. Unknown buckled his belt and walked out of the exam room into the hallway with its stained blue carpet. Five steps at most to the doctor’s personal office. He sat down and waited, watching three fish swim in the dirty aquarium. One of them, something black and yellow, was covered in white fungus. Unknown took his antibacterial gel out of his pocket and cleaned his hands. The doctor walked in, hunched, but not slow like he needed a walker, yet. The doctor looked over for a second, a tiny glimmer of recognition the fish were swimming in their own filth and perhaps a new pump might be in order. But that look passed in the time it takes to exhale and he went back to reviewing Unknown’s thick chart. Unknown sat there, taking in the doctor’s words, unsure what to say to the man with canyon-sized wrinkles in his face who was writing something on a form. Maybe c diff didn’t cause fevers back in the day when fire was discovered. “I’m a Yahoo man,” the doctor said, like he was hanging with a group of doctors who were bragging about their alma mater. Unknown turned his iPad on. Unknown looked at the doctor holding the paper out, and placed his hands on the armrests to push himself up with effort and control, taking his time. With two fingers, he pulled the exam paperwork from the doctor’s hand in a manner that was correct and polite, and gave the doctor a nice smile, nodding his head like he agreed with his diagnosis, yes, yes, yes. But Unknown didn’t agree and didn’t say anything. Instead, he turned and took two steps, and looked at the aquarium and the fish facing their last days swimming back and forth in water that reminded him of a lake you wouldn’t want to swim in. He took the paperwork in his hands and rolled the dietary sheet and the exam form up into one tube, like a kid creating a spyglass, nice and tight. Then he took the end of the paperwork like he was placing a round peg in a hole and dropped it through an opening in the plexiglass cover of the aquarium, giving it a push with one finger until it was all the way in and the paper expanded and soaked up the dirty water. Unknown turned to the doctor and said: “You should Google ‘how to clean an aquarium,’ Yahoo Man, before you kill all of them.” Then he walked out, took the elevator down to the parking garage and drove home. 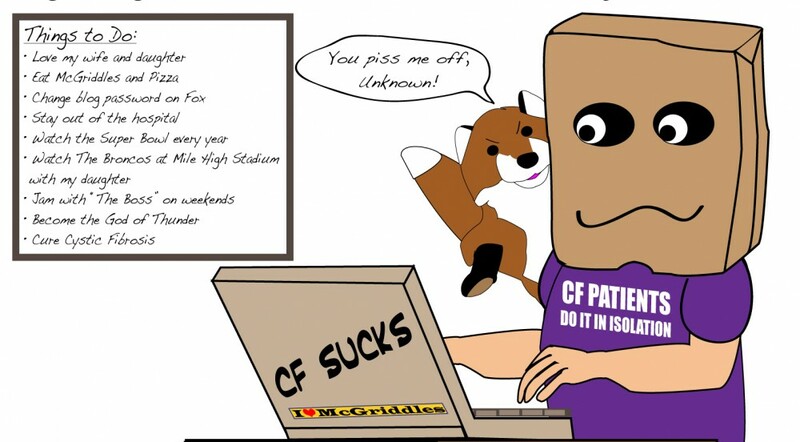 This entry was posted in cystic fibrosis, Fun & Humor and tagged cystic fibrosis, Elmore Leonard by unknowncystic. Bookmark the permalink. Ah, the sample part. Well, that would be the case normally. First, I saw my CF doc on Wednesday and he thought it was a virus. Then I saw the old stomach doc on Friday at 3 pm and he thought it was inflammation caused by a virus. Then bad diarrhea hit at 6 pm Friday and I would have had to wait until Monday to give a sample and wait up to three days for the results. I wouldn’t have made it. So, the CF doc made an executive decision and put me on vanco that night. It’s much easier to identify c diff when you’re in the hospital. ps. i agree with Nanos, you are a genius. You’re a genius writer. 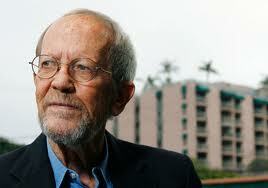 I feel like I shall now narrate my crummy doctors visits in my head like Elmore Leonard. When I win the lottery, you can expect a nice check to buy everything you had in your recent post. I’m not sure I’m a genius at anything but I’ll take the compliment.